Showing off my completed project! As 2018 rolled to an end, I realized I had not built a project for ME this year ..... something just for fun. I have always wanted to build a gothic arch glass project but worried that building a frame might prove challenging. Google provided me with the correct formula for drawing a gothic arch, so I laid one out that measured 18" x 36" on the outside. I am a bit of an amateur carpenter, and was able to figure out how to cut the 2 sides with a band saw and the bottom with a table saw. The next challenge was to create a groove for the zinc channel and glass on the inside of the frame. I ordered a router bit to cut a groove 3/8" deep and 1/4" wide, and although I haven't operated a router in a decade, I managed to cut a perfect groove for the glass. I was so proud of myself, I decided to build two more frames. Always learning! The original frame (pictured on the right) was built from the center leaf of a 100 year old oak dining room table purchased from an estate sale .....such beautiful wood. Since I was planning to paint them, the other 2 frames I built from some scrap knotty white pine. Now that I had successfully built the gothic frames, it was time for a glass design. Using the frame as a size guide, I started the pattern with several exterior color bands and then added some classic Victorian vines scrolling at the bottom. A fleur-de-lis upper element fit in perfectly with the gothic shaped arch. I wanted to include a script W as my central element. My wife had just had some monogramming done with a script W so I patterned my W after that design. So, picture this...... Christmas Day 2018..... Turkey put away....family settled in.....pattern ready to go .... wood frame already built.... I decided I was going to build this window by New Year's Day! Although this piece is only 98 pieces, I design glass to minimize unnecessary lines, so dozens of pieces could only to be cut with a band saw, a laborious process! About 50 hours later, this window was ready to hang, in it's stained and varnished antique oak frame..... as perfect as any window I have ever built..... and completed by New Year's Day. Now, if the truth were told, I did take a break New Year's Eve to enjoy a Dinner Cruise Celebration with my wife.... note the hat! I love working on glass! 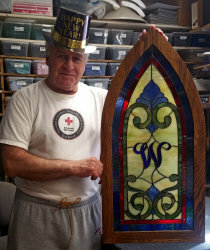 Although I built this window for myself, if there is a "W" person out there that would like it, it is available for sale for $1125..... or I would be glad to build another similar window, the same size, with a different letter and including an oak frame similar to this one.